Cinemablographer: Why Don't You Wanna Wear the Ribbon? 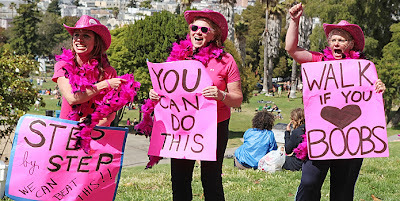 Like Kramer’s enthusiastic friends at the AIDS walk, many a pink-clad woman has fervently marched in support for cancer. It’s a whole culture, suggests one academic. Hoards of people take to the streets in hopes to walk for the cure, run for the cure, or even skydive for the cure. 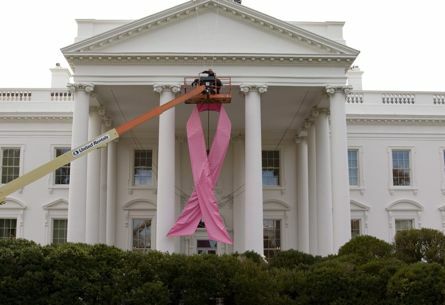 It’s a valiant effort on their part, and the participants admirably raise a lot of money for a good cause; however, Pink Ribbons, Inc. suggests that these large scale campaigns ultimately do more harm than good. In actuality, the “breast cancer community” (as one woman calls it) is really more about selling products and images of femininity. Breast cancer, though, is hardly pretty and pink. The cure, they say, is prevention. Unfortunately, though, little more than 5% of the profits received go towards preventing women from contracting cancer. The film also breaks down the contradictions that arise when so many of the corporations that are supposedly raising money to find a miracle cure for the disease are actually causing it themselves. A bit of a self-fulfilling prophecy, eh? It works, though, because the love for the little pink ribbon has an insane snowball effect. Like the walkers who confront Kramer, a mentality says it’s wrong to oppose such an effort. Pink Ribbons, Inc. takes the other side of the argument and sees a “talking heads” format to allow past and current women who have experienced cancer to share their grievances over the mishandling of the case against breast cancer. Many women, in fact, object to the sanitized approach to the disease made by charities in the name of Big Business. Moreover, much of the language used in the effort to fight cancer ultimately undermines the women who succumb to the disease. As a male viewer, I found the range of testimony to be quite compelling. The little that I knew about breast cancer – in terms of research, treatment, and the disease itself – shows the poor effort of the pink ribbon campaign to raise awareness and share knowledge. One can hardly treat a disease by emitting good vibes. Pool approaches the commercialization, corporatization, and de-politicization of breast cancer from a variety of angles. Using the voices of women who oppose the campaign as well as voices that support it, Pink Ribbons, Inc. substantially unpacks the political, commercial, and emotional quandaries of cancer culture. It’s a solid production overall, yet the many threads of Pink Ribbons, Inc. might best have been tied together more strongly in order to ensure that the argument was more forcefully made, although one of the talking heads condenses the whole paradox of the situation quite succinctly before the film comes to an abrupt end. Would it not be effective if all these motivated, pink clad women put their efforts to greater use, she suggests. Will you want to wear the pink ribbon after seeing Pink Ribbons, Inc? Probably not, or I, at least, most certainly will not.